Each time a Spell Card is activated, place 1 Spell Counter on this card when that Spell Card resolves. This card gains 500 ATK for each Spell Counter on it. If damage calculation is conducted involving this card, remove all Spell Counters from it at the end of the Battle Phase. This monster appears in the artwork of Magical Blast. Both cards are the first Structure Deck Exclusive cards to be in two different Structure Decks. Cerberus was the three headed dog of the underworld in Greek mythology. However, this depiction is inaccurate since the card pictured has two heads instead of three (though depending on the story, Cerberus could have as little as one head or as many as 50). Cerberus also had a brother named Orthrus which was a two-headed dog that guarded Geryon's sacred cattle. The fact that this monster's heads are from different animals also makes it similar to the mythological Chimera. This monster's right head is the same as Mythical Beast Jackal while its left head is the same as Mythical Beast Master Cerberus. Removing the Spell Counters from "Mythical Beast Cerberus" after it battles does not start a Chain. 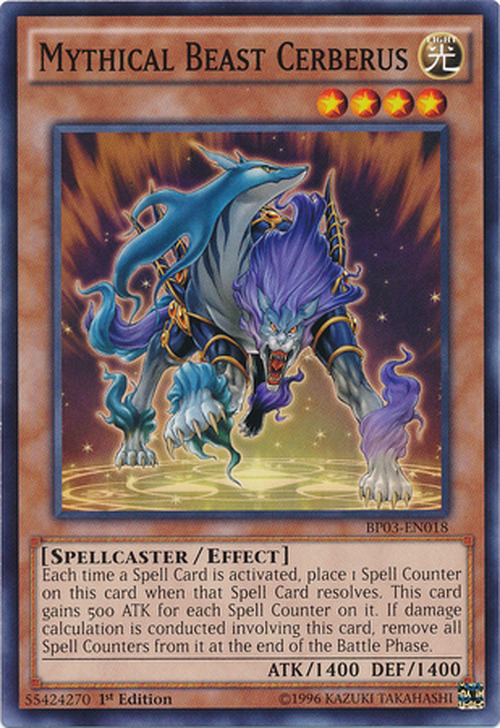 If the monster battling "Mythical Beast Cerberus" is removed from the field before (or during) Damage Calculation, the Spell Counters on "Cerberus" will not be removed. Removing the Spell Counters from "Mythical Beast Cerberus" does not start a chain. The Spell Counters on "Mythical Beast Cerberus" are removed after he battles no matter which player is attacking.